Its E3 silly season, or close enough, and that means plenty of reading between the lines when Nintendo employees dodge and weave from questions. Such is the fate for Hisashi Nogami, producer on Splatoon but arguably best known as a co-Director on the Animal Crossing franchise. First of all, we recommend having a read of his interview with Engadget, in which he discusses some of the creative processes behind Splatoon. It largely reiterates much of what's been said before, but it's nevertheless always enlightening to read about the developer's approach to creating the new IP, its approach to fun design and more. With that in mind, we move on to pre-E3 between-the-lines reading. Animal Crossing for Wii U has long been considered a key release by those following the system, especially in light of the Animal Crossing Plaza that we previously saw, while the rather peculiar amiibo-card app Animal Crossing: Happy Home Designer still seems somewhat simplistic as a standalone download. So, naturally, some wonder whether it's merely a part of a wider plan. In that Engadget interview Nogami-san was asked about when Animal Crossing is coming to Wii U, and answered as follows. Well, that's difficult for me to answer at the moment! Yup. That's pretty much all we can say. What I will say is that you may have seen an announcement recently about an Animal Crossing product coming out on the 3DS... I can tack that on to the end of my response. Some are naturally interpreting that response as a dodge for a potential E3 announcement, but that's purely speculation. It is worth noting that, in the last generation, DS title Animal Crossing: Wild World did precede Animal Crossing: City Folk on Wii by around three years, so a late 2015 or 2016 Wii U title would follow naturally from Animal Crossing: New Leaf. There's also greater scope for interaction between New Leaf, Happy Home Designer and a prospective new release, too, through the Nintendo Network and amiibo. That's all reading between the lines, of course. Do you agree with those interpreting this as a possible precursor to an E3 announcement, or is this much ado about nothing? Ok... didn't they do stuff like this about Metroid? And now I wonder, Where's Metroid? Anyone remember the Metroid pin? "Oh, Reggie wore a Metroid pin and wouldn't be strait forward or not when asked, it must be coming!". Yeah, when they say it, I'll expect it. I hope this confirms AC Wii U for E3! Hmmmmmmmmm... I almost don't want Animal Crossing on Wii U cause then I will have to play Animal Crossing again for another 200+ hours. Also Animal Crossing definitely feels better on a portable. But then I would have no real complaints if it were true. I hope this is true! I'd be one of the first to preorder! I don't understand why so many people want AC on Wii U so badly. City Folk was heavily panned for not being portable (in addition to being basically a port of Wild World) and I'd assume AC just does better on handhelds. I did play AC:PG and AC:CF extensively and I would do the same with a Wii U version, but I'd prefer they just keep the series portable until they make it cross-platform with save transferring like MH3U. I want this and Endless Ocean U !! Is E3 a better time for you? omg! The Animal Crossing series were my childhood! @BooJoh People pan a lot of things if they are not portable even if they started off on a home console. 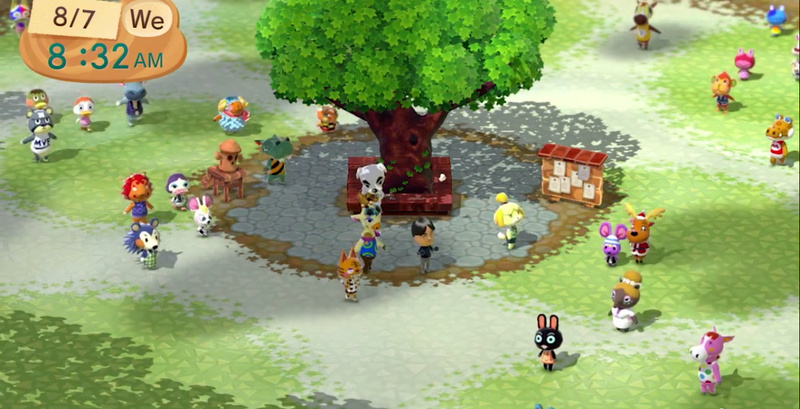 There will be a animal crossing for the wii-u. Considering that Fire Emblem and Animal Crossing pretty much exploded 3DS sales... yeah. But, I have a feeling it'll be a rushed mess like City Folk was. I find it amazing how huge of strides AC games make when they jump back to handhelds, Wild World was a massive improvement over the first AC, but City Folk was only a small improvement over Wild World (If any improvement at all, in my humble opinion) while New Leaf was a gigantic jump from City Folk. I don't expect another giant jump in content. Animal Crossing amiibo… Oh, my Gooooood! As long as it's not a port like City Folk I'd love an Animal Crossing on Wii U. @AugustusOxy Good point. Animal Crossing may have started on a console, but it works so much better as a handheld. Even though City Folk had noticeable improvements over Wild World, it was still so much less playable. Animal Crossing in HD would be awesome. I love New Leaf so a possible Wii U entry would be a no-brainer for me. He didn't suggest that there would be an E3 announcement but if there isn't an Animal Crossing game coming out for Wii U at some point in the future I will be VERY surprised to say the least. 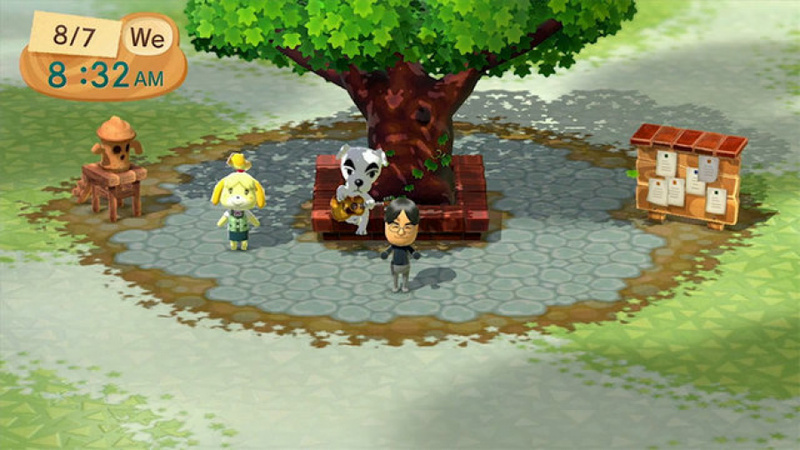 I really liked the look of Animal Crossing Plaza on Wii U, not to mention the song that played with KK's guitar. Honestly it would make that "happy home designer" game...thing? make more sense. Wii U version hopefully this year. Only games coming this year being announced? Animal Crossing potentially being a major release? Oh God, it's 2008 all over again at E3. So this all but confirms that Animal Crossing U is in the making. Will it be at E3 ? IDK, but Possibly and now My doubts that this is the holiday game to replace Zelda U.
I still start the AC plaza occassionally (no longer available for download) just to zoom in on my favorite AC characters in gorgeous HD. Makes me want this game so bad! Here are three hints that it may be coming to the Wii U: the plaza, the AC attraction in Nintendoland and the AC course in MK8. Oh my this will be a crushing disappointment if true. Everyone's looking forward to E3 and some big reveals. Something to replace Zelda is needed, will we get Metroid? F-Zero? Something new? Instead it could be Animal Crossing, a challenge-free time killer that works far better on a portable. Its going to be 2008 all over again isn't it? If this is to be Nintendo's big E3 surprise I'll be disappointed to say the least.If it's one of 3 or 4 bigger surprises then OK but a trailer will do.Too much focus and we wont hear Reggie speak above the collective groaning. I really hope this isn't the case, I'd much rather they spent their time on other games! I understand there's a large fan-base (even though I don't understand why), but I played New Leaf for a while, and it hardly seemed like a game to me - you get fossils to make your house bigger, and fill it with furniture - anything else to the game? That does not deserve a prime Wii U spot imnsho. I can just imagine it now,1/4 of the Digital Event will be Shibata and the AC team talking AC Wii U,another 5 minutes of how it can link with Happy Home Designer and how the costume and wardrobe possibilities are endless,maybe a few more about how it will connect with a future mobile app.Then the big finale at the end,Tom Nook revealed as paid DLC for Smash and available in the Eshop "Now". The most depressing thing about all that is,it could very well come true. I was 100% certain Animal Crossing U was coming at E3 until they made the mobile announcement. I thought it might get shifted to mobile instead as they'd make a killing with micro transactions. It's not for me though. Played the DS game and didn't touch another AC until New Leaf but it still felt too similar despite almost 10 years between the two. Anything that helps the Wii U sell though. I would recommend everyone to register to this website if you want to as it will be perfect for when Animal Crossing Wii U DOES come out. You can buy and sell your items on Animal Crossing New Leaf while you wait for AC Wii U.
I'm looking at this as being less of a "we're going to announce it at E3 so we can't say anything." and more of a "we're working on something else right now (Happy Home Designer) so it could be a while." Guys, clearly this is referencing a Mother 3 Wii U HD and Startropics U collaboration with Eternal Darkness. It's just obvious like that, maaan. Read between ALL the lines. why do i get the feeling the Amiibo card powered one is coming to WiI U via cross buy? I've never played animal crossing. What makes it so popular? @Killabyte28 It's hard to describe, but it short: it's fun. There is a loveable charm to wandering around town, digging for fossils, collecting money to spend at the shop or on your mortgage. Fishing is nice and when you get to explore the tropical island it's just a really lovely game. The music is excellent and the way the town changes depending on the time of year is also kind of magical in a way. Best but not least is the villagers themselves. As your relationships grow with them you get some really funny conversations and when they are happy to see you, they can give you gifts or just say nice and uplifting things. Also, even better is when the villagers start interacting with each other, the personalities clash so they can start party hat koala about each other behind each other's backs or throw parties for one another. Animal Crossing just oozes charm. I like how we've gotten a lot of hints / hunches about other games, but the moment a developer merely answers a question about Animal Crossing on Wii U, some people act like that's all we're getting. @Killabyte28 Depends a lot on who you are - for me, there's nothing to do, no gameplay. Is Animal Crossing coming to Wii U? "Well, that's difficult for me to answer at the moment. Yup." Okay, well, that means it's confirmed! He said, "yup!" There's so many possibilities! It must happen! Haha. Poor Ravi. Nobody noticed he was being electrocuted by his Wii Remotes. I dont follow AC more than knowing it has a following - not sure if its cult size or big but it is verbal - but Im wondering is AC yhe type of game that vould be announced at E3 and released that same year? Most games at E3 seem to release the following year unless theyre small. I would like to see it release, if just to give Wii U some more games. If it looks as good as the MK8 level and plays in an open world 3rd person view like Uncharted and Tomb Raider I might even give it a shot. I know it isnt even remotely the same game as those, Im just talking about the look. Splatoon models of Spike and Capt Cuttlefish look really good. And the squidlings walking around Inkopolis as well. Id play AC if it looked like that. Squid skipping to dub pop. But also, it almost feels like villagers are often an afterthought where as designing your house and collecting is what's more important. But the game is called Animal Crossing, not build-a-house workshop. Let me go... I dunno, play a sport at a local park with my villager, or let me be able to play 2 player NES and SNES games via virtual console with a villager being player 2 (Controlled by AI of course). It probably wouldn't be easy, and Nintendo would never just give virtual console games away in-game anymore, but it would be awesome. At the very least, there should be games that are available on the eShop purchasable in-game and playable in game too. With the quality of the models they already made for that simple Animal Crossing Plaza App thing on the Wii U, I don't see it making any kind of sense if they don't just expand upon that and turn it into a full Animal Crossing game for Wii U.
I mean that's basically exactly how an Animal Crossing game on Wii U should look. Just expand it out, and done. It's really kinda that simple. Well, Animal Crossing New Leaf is one of my favorite games of all time, so I hope with all my heart a new one is coming out. It's honestly the only thing I want to see at E3 this year. Everything else I see is just an added bonus. @rjejr Yes and Animal Crossing Lets Go to the City did exactly that at the memorable E3 2008 conference (seriously if you haven't watched it you should because of how hilariously bad it is). Yep, it's guaranteed. If he doesn't say "No." or "There is nothing to announce at this time, please understand. ", he's gonna leave the door wide open. Which makes it almost confirmed. After all, he has no reason to say "No." when it is in development. @Mezurashii Your profile pic matches your comment perfectly. Yeah, guess I totally screwed up, that's what I was thinking, but even back then those graphics looked so simplistic to me I always thought they were just 2D sprite based. Not that there's anything wrong w/ 2D games, I still play a few that way. Well, I still have my Wii speak on top of my TV if they want to use it in another AC game. Guess we'll see, but you do have my full attention now, thanks. @rjejr No, the whole press conference. @Grumblevolcano - Noooo! Not the Wii Music segment! Nooooo!!!!! Thats just something that can't be forgotten. @MaciejKuczynski Really? I honestly hope Amiibo take no part in this game whatsoever. They're a useless cash grab that Nintendo keeps shoving down our throats and I assume they force the developers to implement them too. More and more games are becoming about these stupid toys, and I can't wait until they all are cancelled. Animal Crossing is doing perfectly fine without Amiibo, and I sincerely hope it is not considered for this title. Deep down, though, I know if an Animal Crossing Wii U game is made, it will have Amiibo. I won't buy them no matter what, but I'm sure it will be added without hesitation and will add arbitrary minimal features to the game. @Sanicranfast Animal crossing is a mindless 3d kiddie game for a casual gamer not like the good ol Snes and Sega genesis classics those were something to dream about. I'm kinda AC'd out. Loved the first one but each new one felt like the first one with a minor tweak. I'm not really sure they could change the formula enough to justify me plonking down another $40-$60. New Leaf looks like the end of the line for me. @Sanicranfast Thanks for the info. I'll watch some vids on youtube later this week. It would be great on the Wii U once they made it different enough to new leaf which was amazing. I just want that feeling of a new AC experience that New Leaf gave me like I want something that expands the franchise and isn't the equivalent of a HD port. I hated City Folk for being way too similar to Wild World, although the separate city area was a good idea and well used in New Leaf. I just hope a new AC is genuinely different to New Leaf. Not my thing at all! Whilst animal crossing does have a massive following in the portable market I'm not convinced it would sell a single Wii u console. It appeals to people already in the palm of Nintendos hand and doesn't look like the sort of title that would do much to enhance the problem of the consoles public perception as 'for kids'!! I'd get it if it happened. AC is a fairly lax series that I like playing, and it would look beautiful in HD. However, I don't take the co-creator comments to mean that it will be announced soon or that it's even coming. Don't get too excited. How many times have we thought something was coming at E3 and found out it wasn't.